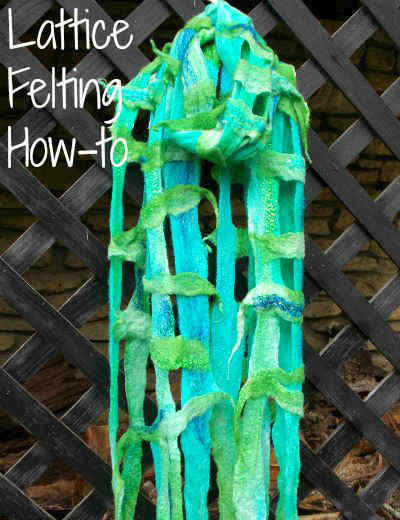 Part 4 of my Wet Felting Techniques Series which shows you how to make a Lattice Felted Scarf. 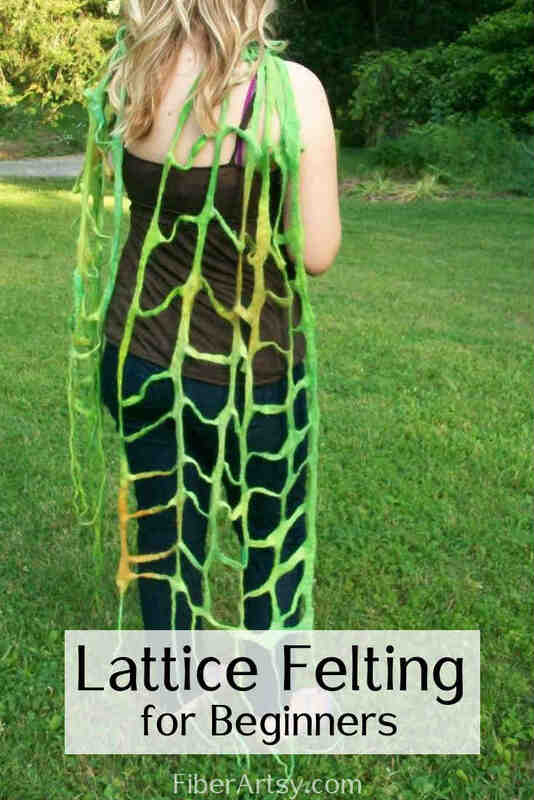 What the heck is Lattice Felting? Just like the name suggests, it’s a wool wet felting technique which produces a fabric with holes in it. There are a few different ways to achieve this. One method is to wet felt a solid piece of fabric with wool fiber and then cut in the holes with a pair of scissors. 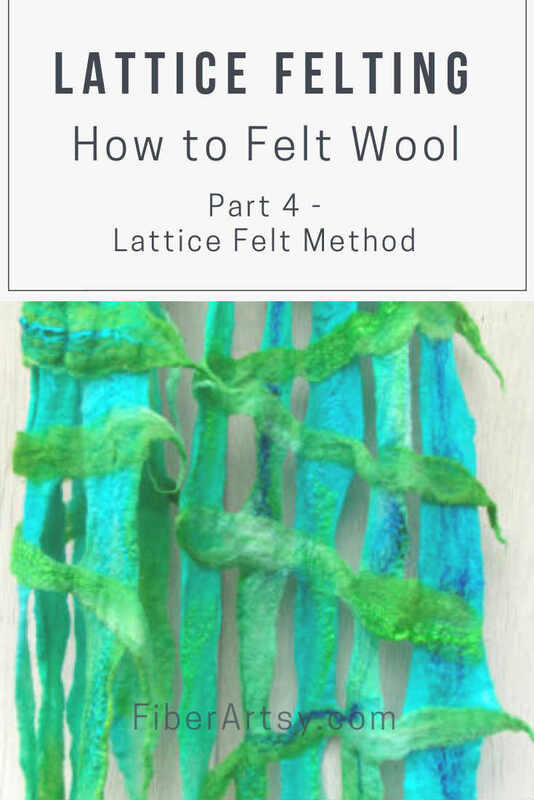 With this tutorial, you’ll learn how to lay out the wool or roving to produce the holes without cutting the finished piece of felt. 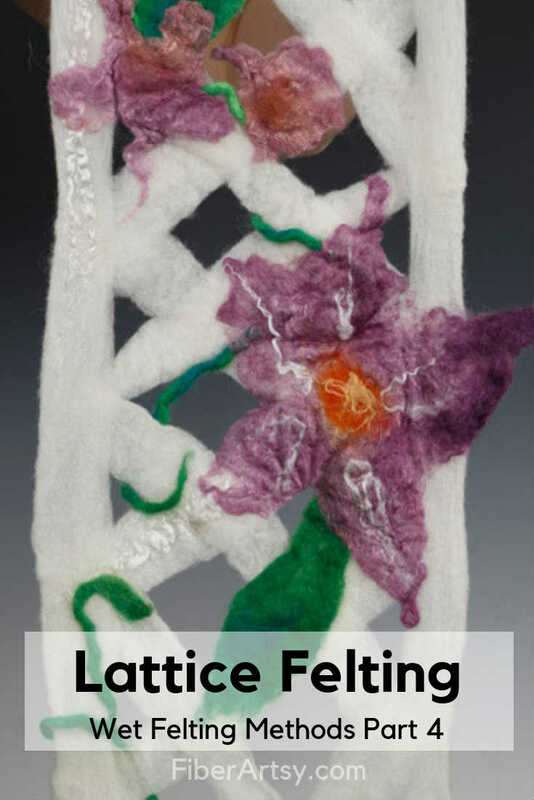 If you’re a beginner feltmaker, you may be interested in Learn Felting? A Beginner’s Guide. Cover your table with plastic and lay down the blind or bubble wrap. If using bubble wrap, make sure your pieces are larger than the final scarf. Begin by drafting or thinning out your roving. I’m using merino wool which comes in a pretty thick roving so it needs to be drafted. Take a piece of roving and firmly hold it with one hand. With your other hand, take a hold of the wool roving about 12″ away and gently pull to thin it out. This takes a bit of practice to get it even. If it breaks, no biggie, just overlap the ends. 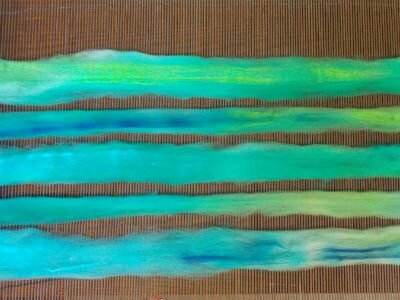 Lay down your drafted roving lengths in one direction. I used 5 lengths about 8 feet long. 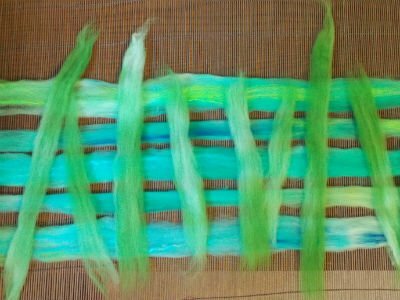 Once you have finished placing the first layer of strips, add some silk, if using. 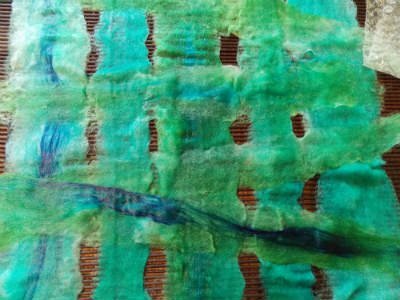 I like to add silk to my pieces to give them more dimension, texture and luster. It’s completely optional! 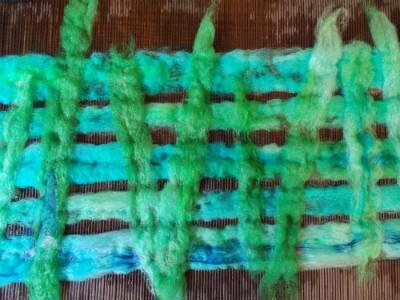 Again, draft your strips of roving and then lay them in the opposite direction, creating a lattice pattern. The lines don’t have to be straight and can overlap each other and the edges for a more artsy look. Again, add bits of silk. Now, you are ready to begin the felting process. Fill your bottle with very warm water and add a couple squirts of soap. Sprinkle the wool roving thoroughly. 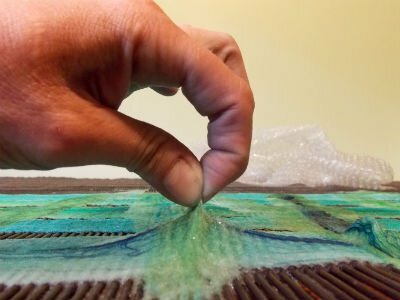 Lay a piece of plastic or bubble wrap over a section of fiber and begin rubbing the surface with your hands to work the water into the fiber. 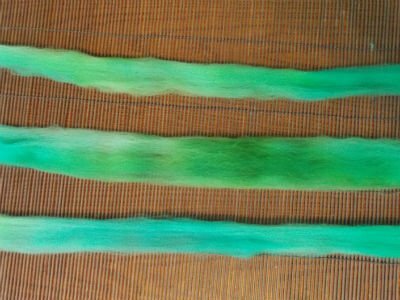 You want to make sure that the roving is completely saturated (dry fiber won’t felt). Add more water, if necessary. Do this to all of the fiber, again, making sure it is completely wet. At this point you can also adjust the edges where needed. Some of the holes in the lattice work may have been closed up by fiber. Gently, move the fiber back in place. Beginning at one end, tightly roll up the blind or bubble wrap. 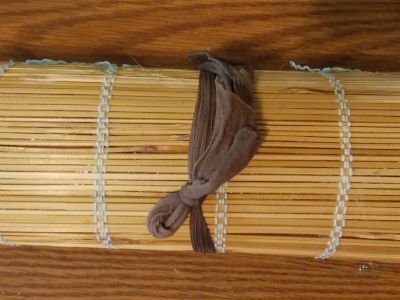 Using yarn or nylon hose, tie your roll in 2 or 3 places to secure. Now, lay your hands on the blind and begin rolling it back and forth, from your hands to your elbow and back again. Do this about 200 times. Arms getting tired yet? 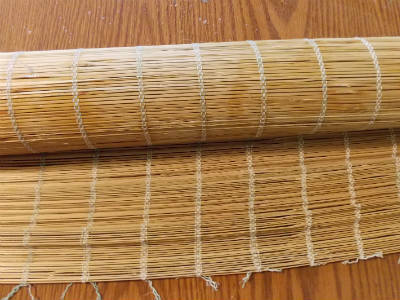 Slowly and carefully, unroll the piece, re-wet your fiber and roll it up from the opposite end. Again, secure with string and roll it back and forth another 200 or so times. At this point, the fiber should be felting well and holding together. Carefully, unroll your piece and do a pinch test. With your thumb and forefinger, pinch a bit of fiber and gently pull up. Is it holding together? If yes, move on to the next step. If no, continue rolling. Next step….throwing! 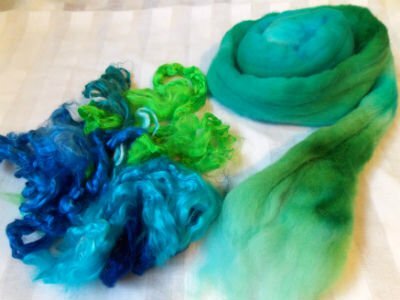 This will full your fiber, meaning it will shrink and complete the felting process. Don’t start throwing until your piece has passed the pinch test! Make sure all of the fiber is holding together, especially the joints where the pieces intersect. 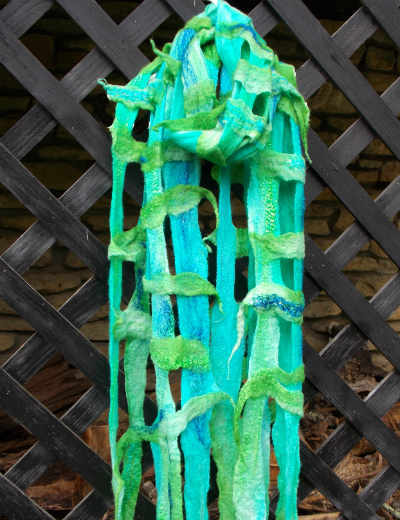 Pick up your scarf GENTLY, wad it up and let it fall on the table. No force here, just gently let it drop. Pick it up and drop it again. Do this about 50 to 100 times. After a while, you’ll notice the fibers firming up so you can increase pressure. Now, carefully lay it out and pull apart any areas that are not supposed to be sticking together. Continue throwing your scarf until it firms up. The longer you throw it, the more the felt will harden and shrink. Once it’s all holding together, how long you throw it and how much you shrink it, is up to you. 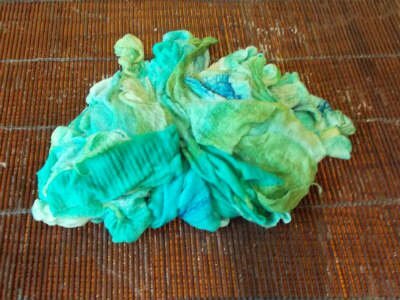 All that’s left now is to thoroughly rinse all the soap out of your scarf. Hang up to dry. Stay tuned for my next Wool Felting Tutorial. 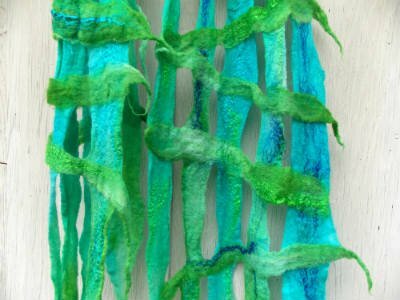 Have you tried wet felting? How’d it turn out?